6228 ✉ 180VIII 80 Pfg. 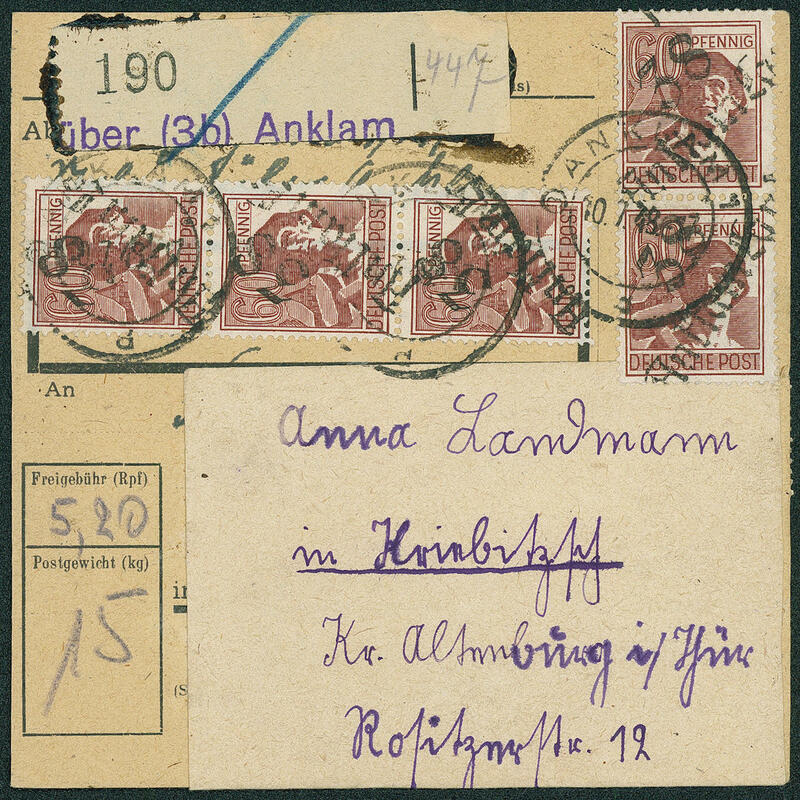 Worker with hand stamp 37 Schönberg in blue black, five pieces as correctly franked mass multiple franking on package card from \"CARLOW 3.7.48. \" to Zipsendorf. Very decorative and extraordinarily rare! 6230 ⊙ 170X 12 Pfg. 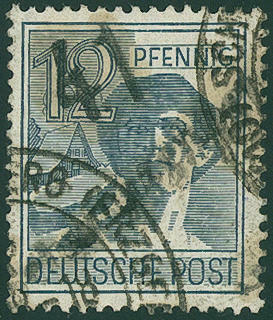 Worker with hand stamp \"41 SCHWARZENBERG (having two parts) \" neat cancelled \"SCHWARZENBERG\". This is a very scarce overprint forgery to the detriment of the post. There are only few examples from this known. Photo expertize Dr. Modry BPP. 6232 ✉ PA01 6 Pfg. 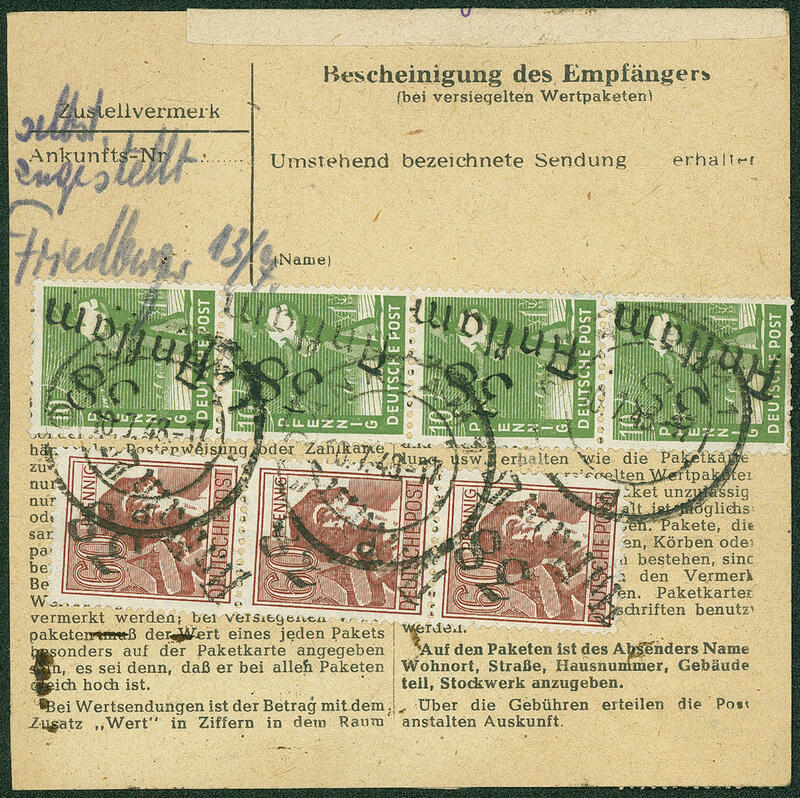 East Saxons, need postal stationery with two postcode circles in green with postmark from post office \"WEIXDORF (circle DRESDEN) in violet with handwritten registered 6 Pfg. And taxe precu stamp. 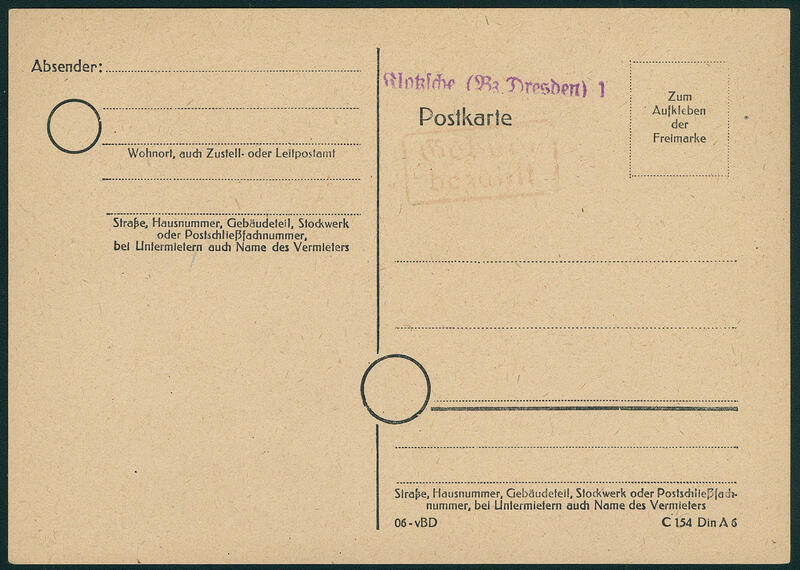 The need postal stationery was commercially used in \"DIPPOLDISWALDE 25.2.46. \" and to Dresden transported. Transported need postal stationery of this kind are very rare. Photo expertize \"genuine and immaculate\" Ströh BPP. 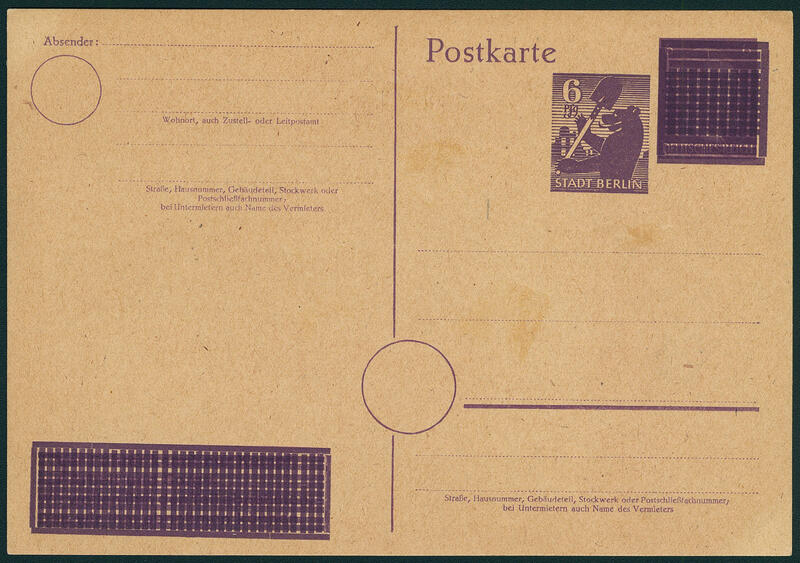 6233 ✉ PA04 Need postal stationery from Klotzsche (district Dresden), pasted over German Reich 6 Pfg. Hitler with additional violet single line cancel \"KLOTZSCHE (BZ DRESDEN) 1\" and red rectangle cancel \"taxe precu\", tear at the bottom glued at the back, unused. Certificate Ströh BPP. 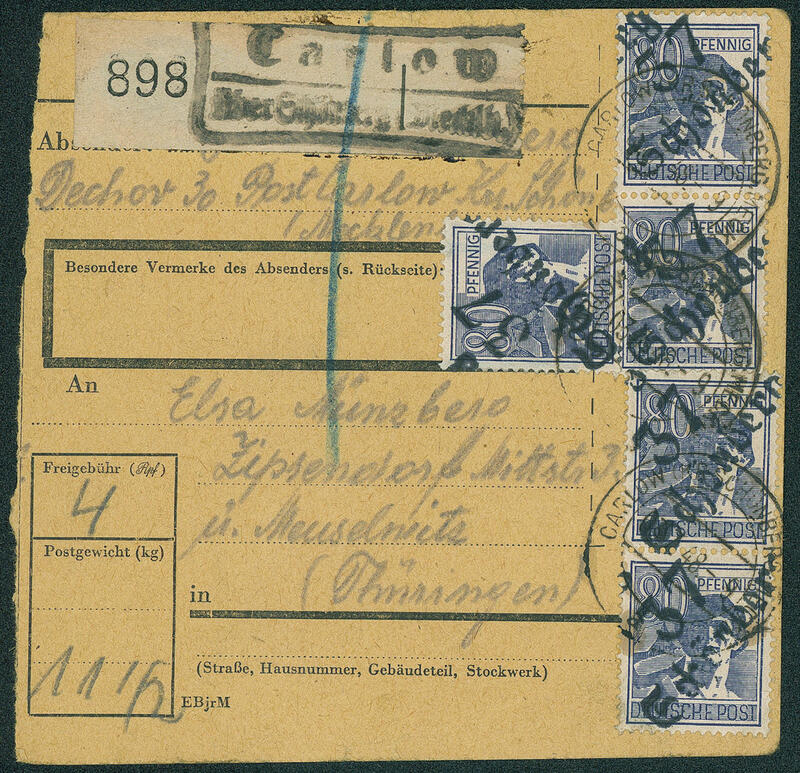 6234 ✉ PA05 Need postal stationery with violet single line cancel \"KLOTZSCHE (BZ. DRESDEN) 1\" and red rectangle cancel \"taxe precu\", unused in perfect condition. There are only few examples from this known. Photo expertize \"genuine and immaculate\" Ströh BPP. 6231 ✉ DRP314I 6 Pfg. 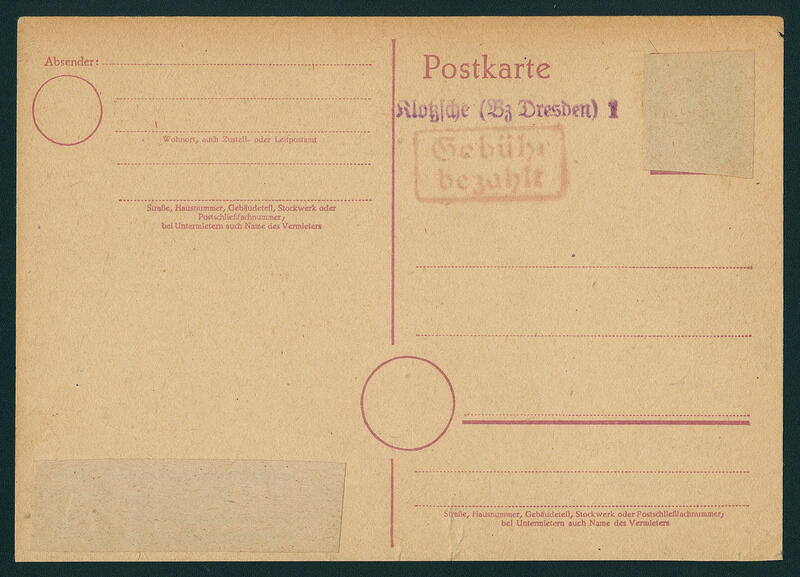 Honour issue city Berlin, spectacular postal stationery proof on German Reich 6 Pfg. Hitler unused. These postal stationery arrived not to the issue. A rarity of this area! Photo expertize \"genuine and immaculate\" Ströh BPP. 7126 literature The German post in Palestine 1898 / 1914, very nice handbook from Juergen Falk, 499 sides with numerous illustrations, explanations and so on. Over use form, Postal service place, tariffs, stamps, stamp and so on, as good as new. 7127 literature German Demokratic Republik (East Germany), universal catalogue, Transpress publishing house, issue 1986 with valuations of the SBZ, German Demokratic Republik (East Germany) and German local issue. Many variety, the also in the Michel special catalogue unlisted are. 7128 literature German Demokratic Republik (East Germany) universal catalogue from P. Fischer, F. Skupin and W. Gudenschwager from the year 1985 with numerous interesting variety of the German local issue, Soviet Zone and German Demokratic Republik (East Germany) with valuations in East German mark, whereby many also in the Michel catalogue unquoted is. 7129 literature The German horseshoe cancel, catalogue from Friedrich Spalink, 3. Edition with pressure ratings, 187 sides. 7130 literature Liechtenstein, handbook, published from ring the Liechtenstein collector in four ring binder with illustrations, valuations and so on. 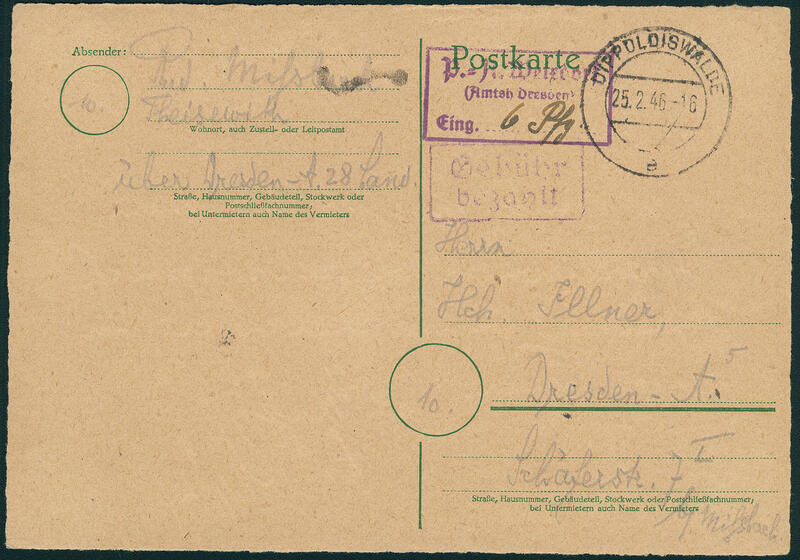 To different topics as for instance pre-philately, Zeppelin mail, frankings and so on, still in the DM time issued. 3229 jewelry Interesting lot gold jewellery, as well to chain, rings, pocket watches (function unverified) and so on. Please have a look! 3230 jewelry Interesting lot gold jewellery, many necklaces, as well also rings, in different levels of quality and so on. The Gold fine weight amounts 125 Gram. 3231 jewelry Interesting lot gold jewellery with attractive material, please have a look! 3232 jewelry Interesting lot jewellery, Gold and silver jewellery, as well nice rings, to chain pendant, earrings, and so on. Please have a look. 3463 jewelry Interesting lot of gold jewellery, as well a number of rings, as well also necklaces and so on. The Gold fine weight amounts 85, 5 Gram. 3464 jewelry Interesting lot jewellery, with also a nice white gold chain, a golden bracelet with coin pendants, rings and so on. Please have a look! 3465 jewelry Interesting lot gold jewellery, as well to chain with interesting pendants, the Aztecs empathized with and so on, ear clips and so on, all with expert opinion of a goldsmith. Please have a look! 3466 jewelry Interesting lot jewellery, as well gold jewellery with a wide gold bracelet, clocks (function unverified) and rings. Please have a look!